Neurons in cortical slices emit spikes or bursts of spikes regularly in response to a suprathreshold current injection. This behavior is in marked contrast to the behavior of cortical neurons in vivo, whose response to electrical or sensory input displays a strong degree of irregularity. Correlation measurements show a significant degree of synchrony in the temporal fluctuations of neuronal activities in cortex. We explore the hypothesis that these phenomena are the result of the synchronized chaos generated by the deterministic dynamics of local cortical networks. A model of a “hypercolumn” in the visual cortex is studied. It consists of two populations of neurons, one inhibitory and one excitatory. The dynamics of the neurons is based on a Hodgkin-Huxley type model of excitable voltage-clamped cells with several cellular and synaptic conductances. A slow potassium current is included in the dynamics of the excitatory population to reproduce the observed adaptation of the spike trains emitted by these neurons. The pattern of connectivity has a spatial structure which is correlated with the internal organization of hypercolumns in orientation columns. Numerical simulations of the model show that in an appropriate parameter range, the network settles in a synchronous chaotic state, characterized by a strong temporal variability of the neural activity which is correlated across the hypercolumn. Strong inhibitory feedback is essential for the stabilization of this state. These results show that the cooperative dynamics of large neuronal networks are capable of generating variability and synchrony similar to those observed in cortex. 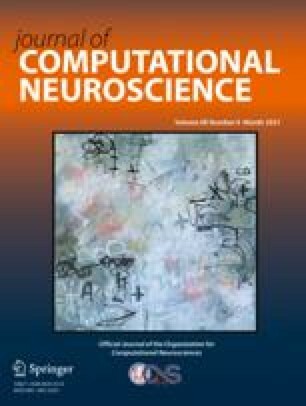 Auto-correlation and cross-correlation functions of neuronal spike trains are computed, and their temporal and spatial features are analyzed. In other parameter regimes, the network exhibits two additional states: synchronized oscillations and an asynchronous state. We use our model to study cortical mechanisms for orientation selectivity. It is shown that in a suitable parameter regime, when the input is not oriented, the network has a continuum of states, each representing an inhomogeneous population activity which is peaked at one of the orientation columns. As a result, when a weakly oriented input stimulates the network, it yields a sharp orientation tuning. The properties of the network in this regime, including the appearance of virtual rotations and broad stimulus-dependent cross-correlations, are investigated. The results agree with the predictions of the mean field theory which was previously derived for a simplified model of stochastic, two-state neurons. The relation between the results of the model and experiments in visual cortex are discussed.